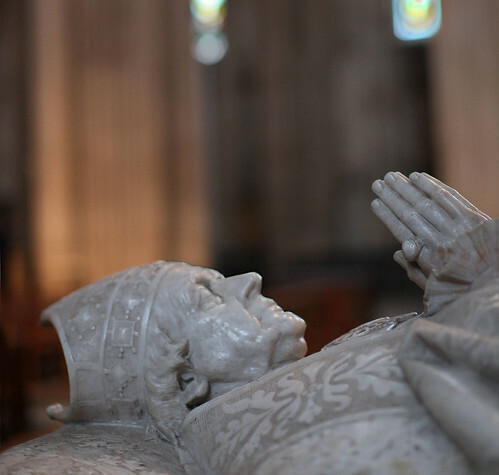 Churches have a lot to offer the photographer… magnificence, detail, contrast, art, history and more. Click the image to view large. Churches are really photogenic places. They provide a wide range of interesting materials, textures, contrasts and subjects. The architecture is often magnificent and feature rich. They are tidy, well tended and active social centres. Photographers can find a lot of interest and endless ways to express it. Not all churches allow photography. Check that you can use a camera and if so under what circumstances. You might be allowed to use a camera, but not flash. Sudden bright lights are disturbing and invasive in a place of peace and worship. All cameras can turn off the flash so check the manual to find out how. Quite often you are not allowed to use tripods either – they might present a trip hazard or block passage. If photography is not allowed this is usually so that you do not disturb worship or block through-ways. Ask the person in charge if there is a time when you could come back and take some shots. Offer them copies of your pictures so they can use them for literature and newsletters. Be polite, accommodating and helpful. If you are willing to work on their terms most people are reasonable in return. It is equally important to remember you are in a place of worship. Churches are places of emotion and feeling. You should respect the privacy, commitment and activities of the worshippers and other visitors. Be courteous, respectful and deferential, don’t disturb others. This will help you enjoy the peace and atmosphere as much as it will enable people to go about their worship undisturbed. Churches and places of worship are not state maintained. It is worth remembering that the congregations raise the money for the upkeep of the staff, buildings and equipment. If you are in a church and taking pictures please consider donating a few pounds to the church funds. It helps the church to stay open and keep the buildings in good condition. 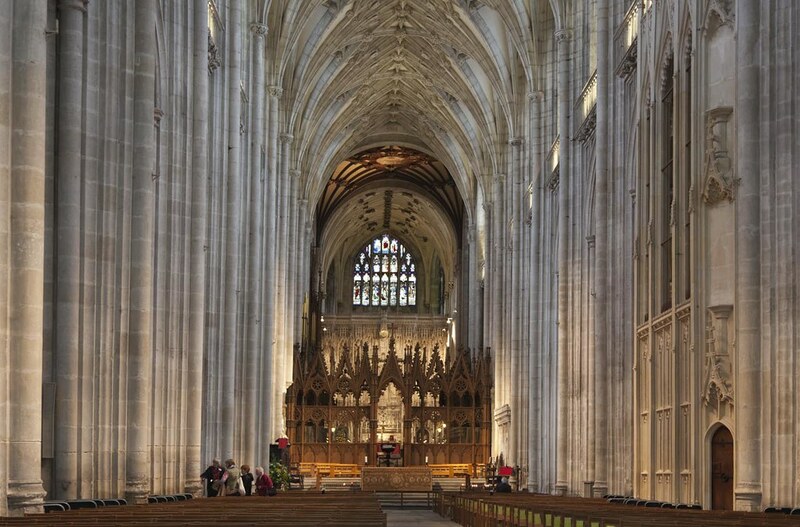 The magnificent proportions of churches and cathedrals is intended to awe people who visit. And it works on me. Even small chapels are more cavernous than the the local houses, a fact not lost on worshippers. To capture these proportions and to convey this same feeling in an image is best done with wide angle lenses or lenses which mimic the human eyes. Broadly speaking a wide angle lens will be 24mm or less on a full frame camera, or 16mm down to about 6mm on cropped sensors or point and shoot cameras. We use wide angle lenses to exaggerate the proportions in the longest dimension of the picture. A wide angle landscape emphasises the broadness of the architecture. A wide angle shot in portrait view will really bring out the height and the magnificence of the cavernous roof spaces, arches and supports. The shot above was taken with a 50mm lens on a Canon 5D. The 50mm on a full frame camera mimics closely the way the human eye sees. The design of churches and cathedrals is meant to impress and awe the human eye so a 50mm prime lens is ideal to convey that sense to the image. On a cropped sensor the same can be achieved by using an 80mm Lens. Longer focal length lenses like a 200mm lenses have the tendency to foreshorten the scene. This will cause distances to be less exaggerated. A fact that will make the scene less impressive. Of course careful use of perspective in the composition will help. You can achieve this by placing something close to the camera in the foreground so it appears large compared to the rest of the scene. Shooting in low light and no flash means long exposures to get sufficient light to make an image. If you are not allowed to use tripods there are alternatives. A Gorillapod , a sort of gripping-tripod can be used on the tops of pews. But don’t try to mount your camera on sculpture or features. Bean bags can be purchased cheaply and used to rest your camera on things. One way to take photographs in low light is by adjusting your camera for high ISO levels. This will allow you to have shorter exposures for hand-holding your shot. However, this will introduce digital noise. There is a fine balance, so practice beforehand. You can also open up the aperture to increase the light entering the camera too. Of course this will reduce your depth of field. You will get some nice shots with bokeh in churches. However that will reduce the potential for showing the magnificence of the building since deeper into the scene will be blurred. Exposures in churches are sometimes difficult. However, longer exposures tend to promote the shadow, contrasts and dimensions that emphasise the wonderful proportions of the church environment. It is therefore worth trying to find ways to keep your camera stable long enough for a great shot. Often the light in churches and cathedrals is low level. Try to visit at times when there is great light coming into the building. Often a sunset or bright sunlight at a low angle through stained glass will really stand out. These will lift the mood and bring colour to the stonework. Great light lifts the mood and brings out texture and colour. Look for sunset times or bright sunlight through stained glass windows. Great light helps bring out colour, texture and contrasts. Try to avoid high contrast light. Very bright illumination from a window will often make it pure white and everything inside around it very dark. You need to control that. Focus on the window and press the button – you will get the stained glass – everything else will be lost in white or darkness. Focus off the window and shoot and you will lose everything in the brightness from the window. Instead, look to accommodate both bright and dark by focusing on the places where the light falls, rather than its source. That way you get the colours and textures without the brightness. The astonishing range of things to photograph is great for the photographer. You can exercise a lot of artistic interpretation. The architecture is impressive on the larger scale. On the other hand the the stone-work, detail and carvings are worth following up on the small scale too. There are art works, carvings and textures as well as people and activities. All are worthy of photographic attention. You have to start somewhere. The outside of the building tells its own story. To tell it properly shoot inside first. You gain a sense of history and find more about the building. While inside look for clues about what is important in the building, the design and the build history. This will help you pick out the best features of the outside later. I like to sit quietly for a while and take in the view of the inside of a church before shooting. I am looking for the strong lines in the architecture that lead the eye. Tall columns lead the eye upward. Often these lead to buttresses and arches that create a sense of power and support. If you can incorporate this perspective with a long view of the inner space you will convey proportion and depth – the essential magnificence of the church. There are two ways I have found that achieve these layers. A concourse of columns, arches and chambers give the eye a repeating pattern into the depth of the church. 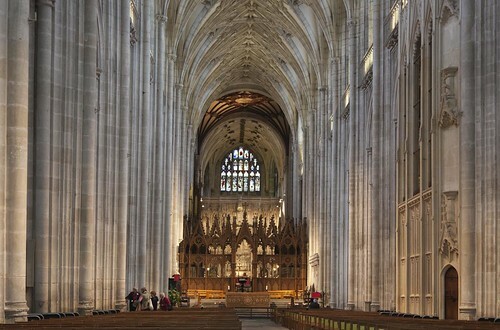 In the picture above the columns and arches in a converging pattern down the length of the nave provides a sense of depth and height. Picking out different activity areas provides a clear definition of depth in the church. In the picture above this is shown by the pews in the foreground, the altar area in the mid-ground and the depth of the ceiling into the distance after that. Individual features of the church make a great study. It is worth taking time and effort to get clear features, textures and detail. Distinct features of the building also provide great shots. Side chapels, sculptures, carvings tombs, artworks all mark specific areas. While they have an interest value on their own, the context is also important. 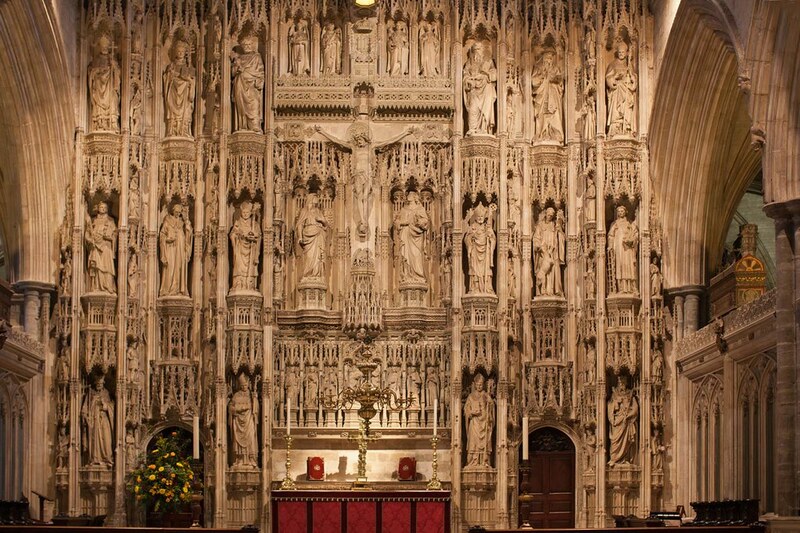 Often the wonder in a place of worship is the history and commitment invested in it over time. When looking in chapels and side chambers try to show the sense of history and the love that has lead to its character today. Of course each place like this has its own character so you need to bring out meaning of historical events, the people involved and the dedications shown there. 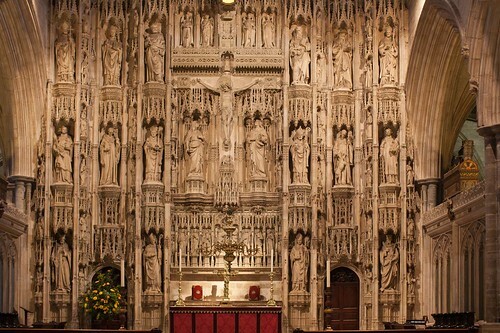 The central feature of most churches and cathedrals is the altar and the space around it. This is where the architecture often comes into its own as a focal point for the eye. So use it. Look for features, lines, supports and other compositional properties that make it impressive. The altar piece itself is often simple. However, it is also a place of colour too. Show it off so that all the best of the features stand out. Try to find ways to catch the light so all the architectural features are well defined by shadow and light contrasts. If they are flat you will lose the power in the artwork. Other points of interest include the people, candles, floor coverings, tiles, carvings, sculpture, coverings, clocks, bells, exhibitions, books of dedication and remembrance… the list is pretty long. It is easy to just snap at these, especially carvings or artwork. Don’t end up making a record shot unless that is the point. Try to get some sense of awe into your pictures so they tell a story. When you shoot these things put them in context. Show a close-up of a carving. Do it close up and powerful, but show the distance away to the next wall too – invite the eye to be impressed. Or, show features like these as part of the whole, so they fit in but have individual character. Outside the building the overall design is important. Often getting a shot from some distance away is a good way to show the magnificence of the building, especially if there is a nice contrast in size, shape or design with nearby buildings or features. Again, a wide angle lens will help with this. Churches are often in urban areas with little space around them. With a shorter view the outside of the building will often look good from close to the walls, looking steeply upward. This will exaggerate the tallness. Make the most of the proportions of the building. Especially follow the lines of the height and depth of the architecture. If you take a shot further from the walls you will get converging verticals. This will take a lot of time to correct in post processing unless you do it artfully. Try to avoid that. Plan your shot so the camera is level, not pointing upwards. The level angle will minimise the convergence but you may find it difficult to get the whole building into the shot. You can still find great views on most churches. So try to concentrate on great features and lines instead. 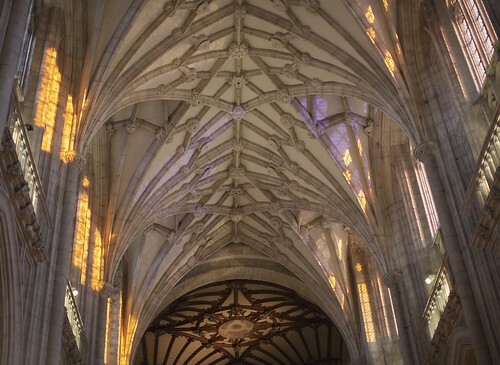 Churches and cathedrals are wonderful places of peace and magnificence. I am amazed at the beauty and awesome architecture. In your photography try to show the commitment and love that has gone into creating these great places and what they represent.